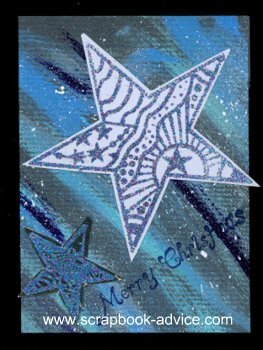 Making you own Hand Made Cards is really quite easy and you can send a wonderful personalized greeting to anyone that expresses exactly just what you want to say. 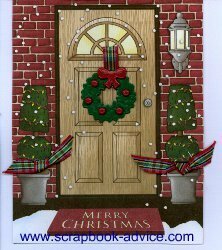 This Hand Made Greeting Card Tutorial or Quick Start Guide to Card Making, will help you get started. My Designs for Hand Made Cards, I must admit, usually come from a tutorial I have seen for a new technique or from an idea that I have seen someone else use. Usually when I make cards, I will pick a design or element, and make several cards along the same line, but each one is different. The above two cards were made using the Michael Strong Closionne Christmas Tree stamped on a piece of catalog paper with photos that had red, green and gold. The images were them embossed in Silver and hand cut out. The embossed images were glued to Black Glossy Cardstock and White Glossy Cardstock respectively. or I make my own. Scrapbook-Advice Tip: If you want larger cards, you will have to make those calculations yourself, but check with the post office to make sure the cards you are planning to mail will meet their requirements. And don’t make too many layers for those cards that will be mailed as you don’t want to have to add additional postage and you sure don’t want the recipients to have to pay any postage due - ugh. There is also a new trend to make Hand Made Cards with multiple folds, gate-fold cards, tri-fold cards, z-fold cards, etc. Take a look at our card making page with multiple videos from other great paper crafters at Card Making Tutorials. Then I like to have a trimmer or paper cutter, strong adhesive, both wet and dry and printed or colored paper or cardstock, and other embellishments, like rubber stamps, inks or embossing powder or glitters, brads, ribbons or fibers. These other items will all be determined by the design on the front of your card. Scrapbook-Advice Tip: And my Scor-it if I really want those creases to look professional - specially if it’s heavy cardstock. This is the most important and usually where my cards begin. Just like store bought cards, you need a Focal Point for the Hand Made Cards. Something that the eye will focus on when you first look at a card. The greeting, an image, a flower, a photo, a hole cut in the center of the card to frame what is on the inside, or maybe a card cut into a shape rather than just being square or rectangle shape. Something you only see in Hand Made Cards. If using a small image for your focal point, you may wish to use several small images that are related or physically connected as a focal point, but try to do these in odd numbers. Scrapbook Advice for cards Example 1: Things numbering 1, 3 or 5 just seem to look better than even numbers of things. Scrapbook Advice for cards Example 2: You decide to put a large Christmas Tree image on the front of your card. Put it a little off center and adhere securely with glue or adhesive all the way to the edge. When dry, cut around the tree branches cutting the front flap of the card as well. This will allow the inside of the card to show through. Or, cut both the front and back of the card in the shape of the tree. 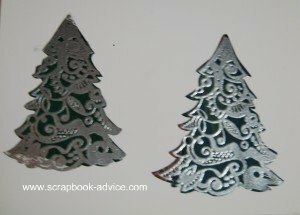 This card on the left from a Christmas Card Making Kit from Personal Shopper shows the Shaped card. The paper glued on the front of the card was the wrapped package - and I cut both the front and back of the card on the top in the shape of the bow. The inside of the card shown on the right was cut at the same time and carries over to the inside the same green print as the paper on the outside. Similar embellishments on the outside and inside are the tags both of which are attached with Square Silver Brads. Note: They were attached before the printed paper was adhered to the card itself so they don't show from the inside or the back. For the card fronts of Hand Made Cards, they can be a printed or embossed paper, metallic, or even fabric background that you have cut and glued to cover the entire outside of the card front. Scrapbook Advice for cards Tip: Cut the paper for the front a little larger that the front. Once glued down, you can turn the card over and use the edge of the card as a guide to cut the paper to size being careful, of course, not to cut the folded area. You can also line up the straight edge of the front paper with the folded edge of the card, then cut around the other edges to make sure you don’t accidentally cut the fold. Or, your card front can be a paper or card stock that fits onto the card front leaving a small border of the basic card all the way around like a frame. 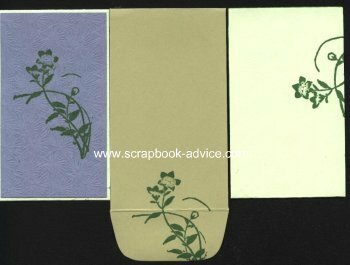 In this case cut your top cover first a little smaller than the card itself, and adhere with even spacing around it, like these below. These 2 cards above were made using Black Glossy Cardstock, and stamps from the Michael Strong Cloisonne Collection. 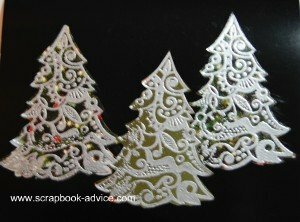 They were stamped on White and Silver and embossed with a Peacock Embossing Powder, then hand cut before being placed on the background. The background pieces are from a 12 x 12 sheet of cardstock that was hand pained and cut into various size pieces that yielded enough to make 10 completed cards when cut small enough to show a frame of the black card stock used underneath. However you design the card front, it needs to be adhered all the way around the edges firmly. This is the part of the card that will be seen and handled the most and you don’t want it to come apart when someone is admiring your work. I would suggest a dry type of adhesive like 2 sided tape or a glue stick. A wet adhesive is likely to be absorbed into the cardstock and may cause warping or wrinkling of some sort. Make sure your Hand Made Cards have that really professional look. Adding embellishments to Hand Made Cards like brads, eyelets or ribbons, may take a bit of planning ahead. Add them to the front of your card before actually adhering it to the basic card so they won’t show from the inside. If you forget this, you can always cover the inside portion of the card with some of the same material that you used on the front. Here again, don’t make things too lumpy if you will be mailing them. This Hand Made Card was also from a Christmas Card Making Kit from Personal Shopper. The printed paper used on the front was part of the kit. Also used were a Brad Buddie for the Wreath and the bow and the red berries in the wreath are brads. Red, white and green Ribbon was used to hang the wreath and make to knots to be attached to the picture of the plants on either side of the door. On your Hand Made Cards, remember to carry over some elements or scraps from the front of your card to the inside of the card. 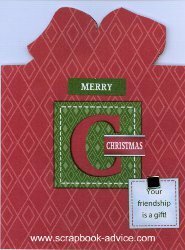 Use some of the covering from the outside of the card, possibly some of the same type or color of embellishments, the same font, or even continue the greeting from the front to the inside. Scrapbook Advice for cards Example: Merry Christmas on the outside and Happy New Year on the inside - Same Font. If covering the entire inside of the card with your pretty paper, don’t cover over the crease. Butte the straight edge of the inside paper to the inside crease so that when you fold it, the inside will not buckle. Scrapbook Advice for cards Tip: If the inside of your Hand Made Cards are a dark color, you may wish to add a lighter color inside to write your greeting on. Nothing worse than having a great card, but no white pen to write with. Have you noticed, they never seem to work past the first day. On the inside of this card, the theme is the same. 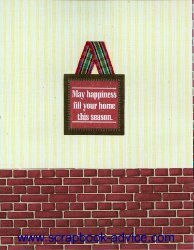 From the "Merry Chtistmas" on the outside to "May Happiness Fill Your Home this Summer" on the inside, to the same brick print and the use of the ribbon to hold the tag. Just like you carried over the front of you Hand Made Cards to the inside, carry over a touch of the design to the envelope. 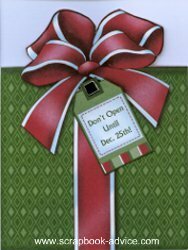 This is particularly nice if you will be handing the card to the recipient or enclosing the card in a Gift Bag or on a package. Card Making Tutorial Tips: I like to do this as well as I make cards in advance and I can tell at a glance which envelope goes with which card. That’s just me. Also, it's a quick hint before the card is opened that it's handmade specially for the receiver. 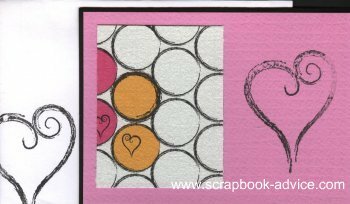 This Pink card from the Club Scrap.com Fizz Kit, shows layered panels of the solid and printed papers with the smaller heart image rubber stamped in black ink on both the card and the envelope to the left. However, if your Hand Made Cards are to be mailed, please be mindful of postal requirements. Nothing lumpy and nothing that may come off or unglued when run through a postal machine. Keep away from the address areas. 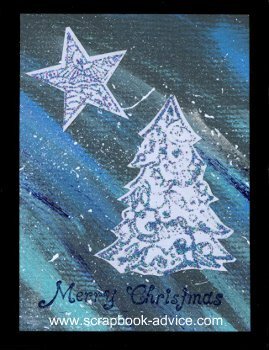 If I have used a rubber stamp element on the card or inside, I like to use a use the same stamp or just a part of in on the back or the lower left hand corner. Or, maybe decorate that back of the envelope flap. I hope this brief Quick Start Tutorial for Hand Made Cards has been helpful.